30 Aug How to define wine? We can split up wine descriptions into 12 main categories of characteristics such as body, fruit, herb, yeast and oak. Even though wine is just fermented grape juice, you can identify an incredibly wide range of flavors within it. 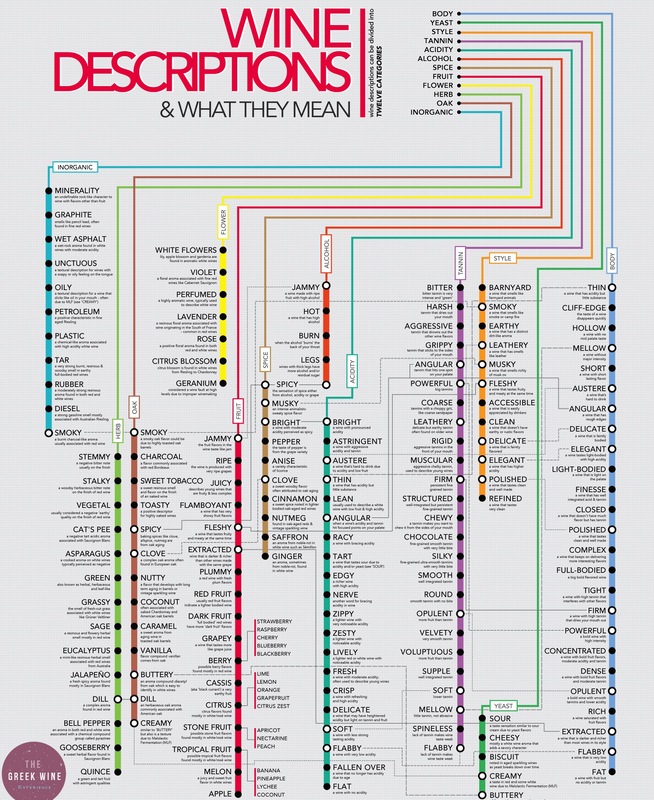 Check the chart attached to see how these definitions are spread all around wine! Want to know how to taste wine? First things first: Make note of the circumstances surrounding your wine tasting experience that may affect your impressions of the win. For instance, a noisy or crowded room makes concentration difficult. Cooking smells, perfume and even pet odor can destroy your ability to get a clear sense of a wine’s aromas. A glass that is too small, the wrong shape, or smells of detergent or dust, can also affect the wine’s flavor. The temperature of the wine will also have an impact on your impressions, as will the age of the wine and any residual flavors from whatever else you’ve been eating or drinking. You want to neutralize the tasting conditions as much as possible, so the wine has a fair chance to stand on its own. If a wine is served too cold, warm it with your hands by cupping the bowl. If a glass seems musty, give it a quick rinse with wine, not water, swirling it around to cover all the sides of the bowl. This is called conditioning the glass. Finally, if there are strong aromas nearby—especially perfume—walk as far away from them as you can and try to find some neutral air. Once your tasting conditions are as close to neutral as possible, your next step is to examine the wine in your glass. It should be about one-third full. Loosely follow these steps to evaluate the wine visually. Straight Angle ViewFirst, look straight down into the glass, then hold the glass to the light, and finally, give it a tilt, so the wine rolls toward its edges. This will allow you to see the wine’s complete color range, not just the dark center. Looking down, you get a sense of the depth of color, which gives a clue to the density and saturation of the wine. You will also learn to identify certain varietal grapes by color and scent. A deeply-saturated, purple-black color might well be Syrah or Zinfandel, while a lighter, pale brick shade would suggest Pinot Noir or Sangiovese. Viewing the wine through the side of the glass held in light shows you how clear it is. A murky wine might be a wine with chemical or fermentation problems. On the other hand, it might just be a wine that was unfiltered or has some sediment due to be shaken up before being poured. A wine that looks clear and brilliant and shows some sparkle, is always a good sign. Finally, give the glass a good swirl. You can swirl it most easily by keeping it firmly on a flat surface; open air “freestyle” swirling is not recommended for beginners. Notice if the wine forms “legs” or “tears” that run down the sides of the glass. Wines that have good legs are wines with more alcohol and glycerin content, which generally indicates that they are bigger, riper, more mouth-filling and dense than those that do not. Now that you’ve given the wine a good look, you’re ready to take a good sniff. Give the glass a swirl, but don’t bury your nose inside it. Instead, you want to hover over the top like a helicopter pilot surveying rush hour traffic. Take a series of quick, short sniffs, then step away and let the information filter through to your brain. There are many guides to help you train your nose to identify key wine fragrances, both good and bad. There are potentially thousands of aroma components in a glass of good wine, so forget about finding them all. Naming all the fruits, flowers, herbs and other scents you can trowel out of the glass can be a fun game, but it’s not essential to enjoying and learning how to taste wine. Once you’ve taken a few quick, short sniffs of the wine, try to look for the following aromas, which will help you better understand the wine’s characteristics. First, you want to look for off-aromas that indicate a wine is spoiled. A wine that is corked will smell like a musty old attic and taste like a wet newspaper. This is a terminal, unfixable flaw. Brettanomyces—an undesirable yeast that reeks of sweaty saddle scents. A little bit of “brett” gives red wines an earthy, leathery component; but too much obliterates all the flavors of fruit. If there are no obvious off-aromas, look for fruit aromas. Wine is made from grapes, so it should smell like fresh fruit, unless it is very old, very sweet, or very cold. You can learn to look for specific fruits and grapes, and many grapes will show a spectrum of possible fruit scents that help you to identify the growing conditions—cool climate, moderate or very warm—of the vineyard. Another group of common wine aromas might be characterized as earthy. Scents of mushroom, damp earth, leather and rock can exist in many red wines. A mushroom smell can add nuance; it can also help you determine a possible grape or place of origin of the wine. Too much mushroom may just mean that the grapes failed to ripen sufficiently, or were from an inferior clone. The scent of horse or tack room leather can be an accent, but too much can indicate brettanomyces. Scents of earth, mineral and rock sometimes exist in the very finest white and red wines. These can be indications of “terroir”—the particular conditions of the vineyard that are expressed as specific scents and flavors in the finished wine. If you smell toast, smoke, vanilla, chocolate, espresso, roasted nuts, or even caramel in a wine, you are most likely picking up scents from aging in new oak barrels. Depending upon a multitude of factors, including the type of oak, the way the barrels were made, the age of the barrels, the level of char and the way the winemaker has mixed and matched them, barrels can impart a vast array of scents and flavors to finished wines. Think of the barrels as a winemaker’s color palette, to be used the way a painter uses tubes of paint. Young white wines and young sparkling wines may have a scent very reminiscent of beer. This is from the yeast. Some dessert wines smell strongly of honey; this is evidence of botrytis, often called noble rot, and is typical of the very greatest Sauternes. Older wines have more complex, less fruity aromas. A fully mature wine can offer an explosion of highly nuanced scents, beautifully co-mingled and virtually impossible to name. It is pure pleasure. Nonetheless, the effort to put words to wine aromas helps you focus on, understand and retain your impressions of different wines. You want to build a memory bank of wine smells and their meanings. That is where the language of wine can add value to a wine tasting event. Learning to talk the talk, if not carried to extremes, helps to dispel some wine myths, such as the confusion surrounding descriptions on wine labels. Have you ever known anyone to ask why a winery added grapefruit to its Gewürztraminer and raspberries to its Zinfandel? The fact that these are simply descriptive terms is not always understood. It’s finally time to taste! Take a sip, not a large swallow, of wine into your mouth and try sucking on it as if pulling it through a straw. Ignore the stares of those around you; this simply aerates the wine and circulates it throughout your mouth. Again, you’ll encounter a wide range of fruit, flower, herb, mineral, barrel and other flavors, and if you’ve done your sniffing homework, most will follow right along where the aromas left off. Aside from simply identifying flavors, you are also using your taste buds to determine if the wine is balanced, harmonious, complex, evolved, and complete. A balanced wine should have its basic flavor components in good proportion. Our taste buds detect sweet, sour, salty, and bitter. Sweet (residual sugar) and sour (acidity) are obviously important components of wine. Saltiness is rarely encountered and bitterness should be more a feeling of astringency (from tannins) than actual bitter flavors. Most dry wines will display a mix of flavors derived from the aromas, along with the tastes of the acids, tannins and alcohol, which cannot generally be detected simply by smell. There is no single formula for all wines, but there should always be balance between the flavors. If a wine is too sour, too sugary, too astringent, too hot (alcoholic), too bitter, or too flabby (lack of acid) then it is not a well-balanced wine. If it is young, it is not likely to age well; if it is old, it may be falling apart or perhaps completely gone. A harmonious wine has all of its flavors seamlessly integrated. It’s quite possible, especially in young wines, for all the components to be present in the wine in good proportion, but they stick out. They can be easily identified, but you can feel all the edges; they have not blended together. It’s a sign of very good winemaking when a young wine has already come together and presents its flavors harmoniously. Complexity can mean many things. Your ability to detect and appreciate complexity in wine will become a good gauge of your overall progress in learning how to taste wine. The simplest flavors to recognize—very ripe, jammy fruit and strong vanilla flavors from various oak treatments—are reminiscent of soft drinks. It is perfectly natural for new wine drinkers to relate to them first, because they are familiar and likeable. Some extremely successful wine brands have been formulated to offer these flavors in abundance. But they do not offer complexity. Complex wines seem to dance in your mouth. They change, even as you’re tasting them. They are like good paintings; the more you look at them the more there is to see. In older wines, these complexities sometimes evolve into the realm of the sublime. The length of a wine, whether old or young, is one good indication of complexity. Simply note how long the flavors linger after you swallow. You might even try looking at your watch if you have a particularly interesting wine in your glass. Most beginning wine drinkers move on too quickly to the next sip when a really good wine is in the glass. Hold on! Let the wine finish its dance before you change partners. A complete wine is balanced, harmonious, complex and evolved, with a lingering, satisfying finish. Such wines deserve extra attention, because they have more to offer, in terms of both pleasure and training, than any others you will taste. Now that you understand the basic steps with our wine tasting tips, it’s time to experiment on your own. It can be quite helpful to build a wine journal of your adventures. Write complete tasting notes for wines you like and dislike. Noting the characteristics that each wine shares will be immensely helpful as you start learning how to choose wine on your own. Time to taste some Greek wines and get some Greek Wine Experience!